On 5 August I went to England on a new Brontë pilgrimage, this time not in Haworth but in London and Wales. First of all, I was determined to see with my own eyes the four letters written by Charlotte to M. Heger in the years 1844-5, the same ones to which sadly no answer followed. 2013 marks the centenary of their donation to the British nation by Heger’s children Paul and Louise so it was really important for me to have the chance this year. I went to the British Library in King’s Cross, London, and having obtained first online and then in person a Reader’s Pass, not without difficulty I might add, I could see at last the so wished-for letters, one by one in a glass frame. I eagerly read the four of them, especially the third, so moving (and stitched), and also the neatly written fourth sad one. Poor Charlotte’s pain was palpable in them and I was highly impressed while deciphering her words in her usually neat calligraphy. Regrettably no photo was permitted in the Manuscript Room while holding these precious ‘selected’ documents. Afterwards I went to Conway in Wales since I knew my Charlotte had spent her first night there after her marriage in June 1854. I looked for and stopped outside The Castle Hotel for photos and videos, knowing it was the inn where Charlotte and Arthur Bell Nicholls had taken a rest before leaving for Bangor and Ireland some days later for their honeymoon. A few moments and I suddenly had the idea to enter the now elegant and luxurious hotel just to ask someone to show me Charlotte’s wedding room. I thought it as a joke but who knew, I might be lucky! 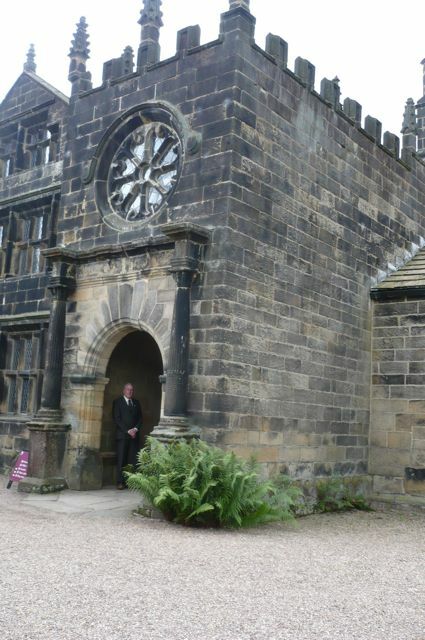 And so it was with my utmost surprise that after some minutes a very kind Welsh person from the reception came to my assistance and really took me in the room that had seen Charlotte Brontë’s presence more than a century and a half ago. But my emotion reached the maximum level when nice, bald Brian showed me the double bed, a dark, carved, seventeenth century tester bed, telling me it really was the bed where Charlotte and her husband had slept that night. I then took a lot of photos and Brian smiled at my being so taken by the bed. When I could breathe I asked him if there are many Brontë fans coming there asking to visit that room but he told me that no, there aren’t any and also the room is the least booked in their hotel since the ancient fearful bed bears the following mysterious inscription on it: ‘God protect me through this night’. When I added that Charlotte’s husband was a curate, Brian burst into a loud laugh that meant, as he explained afterwards, she was well protected! To feel Charlotte’s anguish so vividly and to see her wedding bed were for me two great incredible moments and this August I felt near her more than ever! Whilst visiting my daughter in London today, we happened upon this production of Jane Eyre. There were some very beautiful moments during the ballet and some baffling ones too. Sadly Jane's time at Lowood was completely glossed over. However there did occasionally appear during the performance a ghostly figure of a girl whom I presume was Helen. Her strange zombie like movements which interspersed her otherwise beautiful dancing , were rather off putting and unnecessary. Bertha Mason was centre stage and incredibly powerful, contrasting delightfully with our shy, small and reserved Jane. Bertha did however appear to come back from the dead towards the end of the piece, to re join Rochester and Jane. All three then for some reason took off their clothes. On the whole an enjoyable evening of ballet, with the fire scene being the stand out moment, and the ending being the low point. Click here to read Xinhua on the ballet. 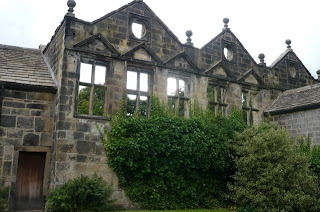 I joined a small group of Brontë Society members on a sunny afternoon at East Riddlesden Hall, a seventeenth century manor house on the outskirts of Keighley, and we were in stitches. You may be forgiven for thinking that the group had gone to watch an Ealing comedy or to take part in some hilarious game show but the stitches in question were of a far more serious nature and had been worked nearly four hundred years ago. The Parsonage Museum director, Professor Ann Sumner, shared her expert knowledge of the seventeenth century samplers which were on display in the Hall. She explained that, after the growing emergence of the middle classes in the seventeenth century, needlework really came to the fore and it was really the golden age of sampler making. These samplers demonstrated the skills, in needlework, of young girls, skills which started quite simply at around the age of five. After hours and hours of practice and work, the girls were producing such things as embroidered mirror frames and book bindings and beautifully worked panels for caskets. These panels were sent away to be made into the caskets which had small drawers and secret compartments. Seventeenth century sewers would buy kits for their samplers from pedlars and these kits contained all the sewing material required and pattern books which would be resplendent with flowers, birds, leaves, fishes and animals. The three samplers discussed were all different. The oldest, surrounded by an authentic tortoiseshell frame, had a biblical theme, which was very common - this one featuring probably Rachel at the well - and was embroidered with butterflies and caterpillars. These two things were a symbol that the sampler had probably been worked in a Royalist household. The second was thought to depict Charles the Second with his wife Catherine of Braganza because the royal lion and stag could be clearly seen. All the samplers were worked in ‘stump’ work or ‘raised’ work and after surviving so long were very faded, but originally the colours would have been extremely bright. Charlotte to Emily from Stonegappe- written in June 1839. In a later age all the Brontë sisters were proficient needlewomen and it is known that Charlotte made her first linen chemise at the age of five, probably taught by Sarah Garrs, the servant, and each girl made a sampler, following in the footsteps of their mother and their aunt. Aunt Branwell instructed the girls in sewing, thinking that really it was only the culture they needed, and when there were plans for a school at the Parsonage needlework was planned to be part of the curriculum. We can see in all the Brontë novels that sewing is a theme running through them all - Grace Poole mends in an upstairs room and Nelly Dean sews as she narrates her story to Mr Lockwood. Caroline Helstone bemoans the fact that the sisters of local men have no earthly employment but housework and sewing. Brontë samplers are on display today in the museum and it is remarkable when looking at the intricate and delicate work of them, and indeed of the seventeenth century ones we saw at the Hall, that all this beautiful work was produced without the aid of our modern electricity.